Preheat oven to 375° F. Cook macaroni according to package directions. Drain and set aside. Heat oil in large nonstick skillet over medium-high heat. Add onion and bell peppers; cook, stirring frequently, for 4 to 6 minutes, or until onion is translucent. Set aside. Combine squash, broth, and milk in a medium saucepan. Bring to a boil over medium-high heat. Reduce heat to medium; gently boil for 20 minutes, or until squash is tender. Place squash mixture in a blender or food processor; cover with lid and kitchen towel. Blend until smooth. 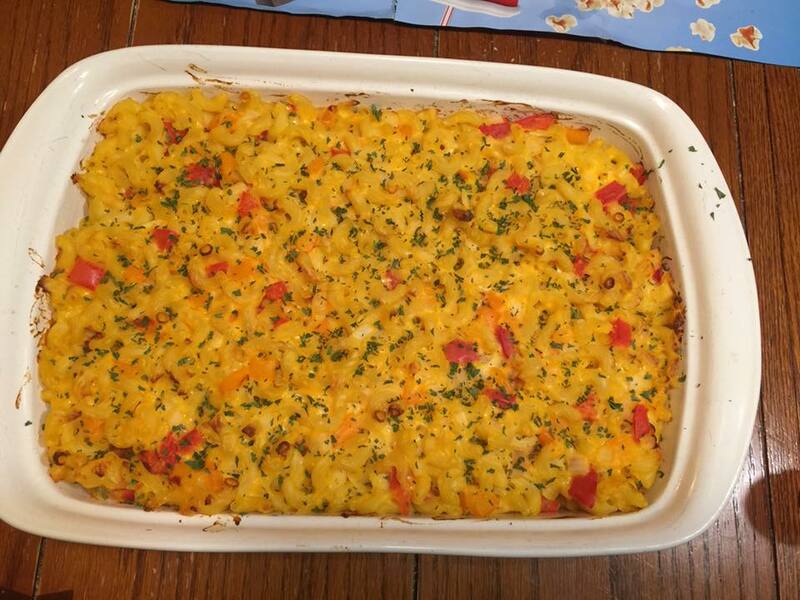 Combine squash mixture, macaroni, onion mixture, yogurt, and cheeses. Season with salt and pepper if desired; mix well. Place macaroni mixture in a 13 x 9-inch ceramic or glass baking dish that has been coated with spray. Bake for 25 to 30 minutes, or until sauce is bubbling. Garnish with parsley if desired.